While I love a solely plot-driven book as much as I love a blustery action movie (i.e. a LOT), a book that has characters of real depth and diversity, like Resurrection Bay, is quite simply a pleasure to read. And having diversity in a book’s characters is, quite honestly, a relief: it shows awareness of the world around us, one that is not full of much-loved cookie-cutter crime staples but actual humans. Here, we follow a profoundly deaf main character, his 57-year-old female ex-cop detective partner, his Koori ex-wife and her extended family, a selection of good-to-partly-good and bad-to-monstrously-bad cops, and friends and passers-by, all of them involved in a case that beats down your door and knocks you out cold from page one, when Caleb Zelic responds to a friend’s alarming message only to find him torn to shreds. Caleb and Gary have been friends since they were children, tearing up Resurrection Bay as rowdy kids, before Gary became a cop and Caleb a detective of a different kind. So when the police seem determined not to follow any leads, Caleb knows he must hunt his friend’s killer himself, no matter where that search may lead. And it leads, inevitably, to him bunkering down in his ex-wife’s house, a relationship ruined by personal tragedy and stubbornness, but one he still treasures. Kat and he have unfinished business, but whether they can tie their loose ends together before Gary’s killers slice them apart is another thing. There are breathless scenes of tension – when your main character cannot hear, what happens when you’re fighting for your life in the sand and you can’t hear what the other person is yelling at you? – and times when I was guiltily desperate to skip ahead just to make sure the people I loved were going to make it through okay. 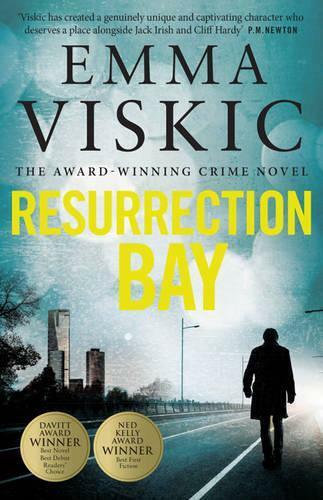 And in the capable signing hands of Viskic – a Ned Kelly short story award winner – you never know what’s around the corner, in the very best kind of way. Fiona Hardy blogs about Crime Fiction at readingkills.com and puts together the Dead Write column for the Readings Monthly newsletter.